The Meigs County Health Department staff includes, (front, L to R) Shauna Chapman, Sherry Hayman, Dawn Keller, Jessica Snoke, Courtney Midkiff, Kim Casci, Jessica Howell and Roselyn, Kiera Frank, Ciara Martin, Laura Grueser, Jenna Roush, Angie Rosler; (back, L to R) Leanne Cunningham, Michelle Willard, Marc Barr, Juli Simpson, Brody Davis, Sherry Eagle, Steve Swatzel and Wilma Mansfield, MD. POMEROY — The Meigs County Health Department recently released its 2018 annual report detailing the services provided, giving updates on the programs offered and looking back at what was accomplished during the year. “2018 was a very successful year at the Meigs County Health Department (MCHD),” stated Health Commissioner Marc Barr in his message. Among the recent successes was the submission of accreditation documentation. “The continued public support, and the driven work ethic of the MCHD employees, allowed for submission of the State-mandated accreditation documents ahead of schedule,” stated Barr. Administrator Courtney Midkiff touched on the resilience of the agency. Midkiff defined resilience as constancy, toughness and willingness, allowing individuals to bounce back from setbacks and achieve positive outcomes despite challenging circumstances. “2018 provided many opportunities for several of you (our friends and neighbors) to build your resiliency and the same was true for the Meigs County Health Department (MCHD), which continued to serve despite of change and obstacles. But as in life, blessings are intermingled with the challenges,” stated Midkiff. Among the challenges at the health department was a greater than usual staff turnover. The majority of that turnover was for positive reasons, stated Midkiff, including retirement, the pursuit of higher education or other employment which better met the personal needs of the employee. Among the new hires in 2018 were Brody Davis and Ciara Martin. Davis fills the role of emergency response coordinator and public information officer, among other duties, while Martin leads the Creating Health Communities program. “We were very fortunate to replace the expertise and experience we lost when staff members ended their MCHD careers with qualified candidates (Davis and Martin) who contributed more than we could have imagined — not just toward our accreditation efforts, but in our overall efforts to successfully provide you and our other stakeholders with the 10 essential public health services,” stated Midkiff. The MCHD also enhanced its customer service with the addition of Clerical Specialist Shauna Clark Chapman. Chapman’s duties were previously handled by multiple staff in addition to their own duties. Kiera Casto Frank joined the MCHD as a Community Health Worker through a grant funded program. On the WIC side, Jessica Howell came on board part-time as the WIC Breastfeeding Peer Helper, allowing WIC Clerk Kim Casci to focus full-time on that role. Personnel changes were not the only changes made at the health department in 2018 as renovation work took place throughout the building. “To enhance our stakeholders’ visits, and to improve staff morale and security, the MCHD in conjunction with the Board of Meigs County Commissioners, invested in the building we occupy by having Rick Walker remodel the entrance and reception area, as well as, replace old carpeting in our hallways and conference room with vinyl flooring,” stated Midkiff. Other improvements included painting of the break room and public areas, which was completed by staff members; the installation of new external and internal signs, made by Jason Shain; repainting of the parking lot which serves the Meigs Multi-Purpose Health Center (health department and senior center); and landscape improvements. The public is invited to see the renovation work and learn more about the services provided by the health department during an open house from 11 a.m. to 1 p.m. on Friday, April 26. “This is what your MCHD has done throughout the years, and will continue to do — move forward for you and our other stakeholders,” concluded Midkiff. 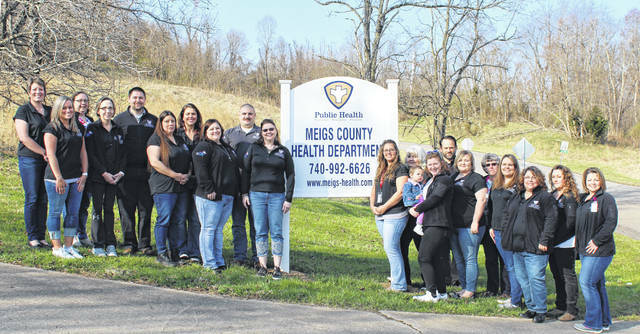 More on the Meigs County Health Department’s annual report, including details of specific programs will appear in upcoming editions of The Daily Sentinel.